Root canal treatment (endodontics) is invaluable in dentistry. Through endodontics it is now possible to predict, treat and save a tooth that, just years ago, would have required extraction. Depending on the number of teeth undergoing treatment and the location of the teeth, it can be a complex procedure. Root canal therapy is needed when the pulp tissue of the inner tooth becomes infected by periodontal disease, decay or trauma to the tooth. 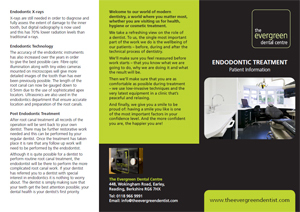 At The Evergreen Dental Centre our highly skilled dentist with a special interest in endodontics will be pleased to discuss endodontic treatment with you should this area of dentistry be required as part of your personal treatment plan. Our general dentists are quite able to perform root canal treatment but certain circumstances may arise where the dentist will refer you to our dentist highly experienced in endodontics and trained to use a microscope for the procedure. It may be the case that your first root canal treatment was not successful and special equipment is required. It could be that the dentist does not feel suitably qualified to perform the treatment on certain teeth that have a more complex anatomy, such as the back molars. After the initial consultation, you will be provided with a personal treatment plan according to your needs, indicating cost and the number of appointments required. We are always happy to answer any concerns or questions. Don’t forget that the treatment can be provided under sedation if you prefer.